Metalworking Machinery & Metal Fabrication Equipment | C Marshall Fabrication Machinery, Inc.
You are looking for metalworking machines? You have come to the right place! C Marshall Fabrication Machinery, Inc. gives customers real advantages on every large and small industrial application of boilers and heat exchangers; tanks and containers for alimentary sectors, agriculture and buildings; tank-trucks for oils and foods, road and heavy transportation; turbines and reactors; off-shore and land windmill towers; light and heavy steel structural works, excavator buckets and any other application in the field of automotive, naval, railway and aero-spatial. Every one of these sectors is carefully studied by our staff in order to give our clients the best machine, system or service. Our machines are built to follow each customer’s specific bending requirements, expressly studied and projected for the task the customer needs to perform. We do not mass-produce and we don’t send out quotations just to get rid of stock. We want to know what the customer’s activity is, what he produces, and listen to what he would like to have in the future and then offer the best machine that can fit his demands. The MG plate rolls are the ultimate evolution in the plate bending field with two dragging rolls with hydraulic pinching allowing a steady and precise material dragging. The MG bending machine is the easiest, most versatile, quickest and precise the market can offer. Three smooth surface motorized rolls. Works both horizontal and vertical axes. Monolithic structure in electro welded steel. Two digital readouts standard on all models. Make C Marshall Fabrication Machinery, Inc. your palce to go when looking for breaks and shears, ironworkers, tough rebar equipment, etc. We have competitive prices and a wide range of models and sizes. Welcome to C Marshall Fabrication Machinery, Inc. Our mission is to provide the finest metalworking machinery from around the world, while at the same time providing exceptional service and support. Selling metal fabricating equipment both at a national and international level we have built up a reputation of quality service, customer care, and outstanding expertise in plate rolls and angle rolls, and special machinery to help you with your hydraulic plate bending needs.Our staff has over 30 years of experience in the Metal Fabrication Industry. Please contact us today for more information! Our goal is to help our customers find the right metal fabrication equipment that they need to be as competitive and profitable as possible. We also will do it for a great price!. If you can’t find what you’re looking for on our Website, please do not hesitate to contact us. Our Plate Roll, Angle Roll, Hydraulic Shear and Press Brakes are the best in Quality, Reliability, Dependability, Durability and Precision making your job easier and safer. Backed by personal customer service and hands-on professionalism, you won’t find a better place to buy than C Marshall Fabrication Machinery, Inc.
To read about our “flagship” – Italian made MG plate roll line, please click HERE. 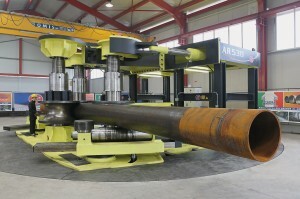 AR 530 is the new section bending machine manufactured by MG SRL, Italy that completes the already large range of models of plate and section bending rolls the company can take pride in its 54 years of life. The AR530 is the biggest section bending machine ever built; it is a giant 29.5’ x 29.5’, almost 26’ high, 340 tons, 220 HP with 1900 ton torque. The AR530 can bend standard and special profiles; T’s and channels, beams, round and sq. Bendmak Flanging Machines & Presses, Punching Machines, Conventional/Self Aligning Rotators, Welding Systems and Column Boom Systems! Learn more about these exciting state-of-the-art machines!